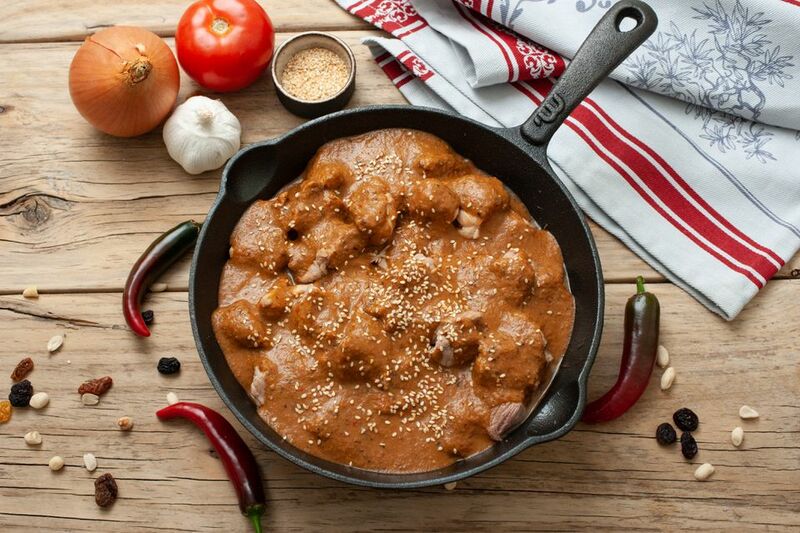 Mole (pronounced in two syllables, MOE-lay), is a quintessential Mexican chile sauce with origins in pre-Hispanic times. It exists in countless versions throughout the country, varying in color, consistency, ingredients, and use according to regional preference and family tradition. But most begin with some common denominators: a blend of chile peppers, tomatoes or tomatillos, some kind of fruit or other sweet element, nuts or seeds, often but not always chocolate, and a blend (usually secret!) of spices. Traditional cooking methods call for grinding each ingredient by itself in a molcajete (mortar and pestle), but a blender will do the job just fine. Mole most often accompanies chicken or turkey, but you can also ladle it over roasted or pulled pork. Leftover mole sauce makes excellent enchiladas or a condiment for rice, eggs, and other dishes. Heat the lard in a large skillet over medium-low to medium heat. Add the onions and garlic and cook until the onions turn translucent, about 8 to 10 minutes. You do not want the onions to turn brown; adjust the temperature as necessary. When the onions soften enough to drape over your spatula, set the skillet aside. In a blender, purée the roasted tomatoes with the peanuts or peanut butter. Add the oregano, cinnamon, anise, peppercorns, thyme, clove, and cocoa powder, and blend to make a smooth paste. Add the sautéed onions and garlic to the blender container and purée again. Add the chiles and raisins and blend into a smooth paste. Pour all of the chicken broth except for 1/4 cup into a large saucepan. In a separate small bowl, make a roux by whisking the masa with the reserved 1/4 cup of chicken broth. Stir the roux into the broth and whisk until smooth. Add the puréed ingredients to the pan. Cover and simmer for 1 hour. Uncover and continue cooking until the mole turns thick and aromatic. Use your homemade mole as a sauce for chicken or turkey or chunks of pork, sprinkling toasted sesame seeds over each portion as you serve. Any leftover mole tastes delicious spooned over rice or fried eggs or used as an enchilada sauce. Traditional moles often contain 40 or more different ingredients and take multiple days to prepare. You can find prepared mole paste—ready to eat after diluting and heating—in supermarkets both within and outside of Mexico.